The HI93414 measures the most important parameters of drinking water: turbidity and free/total chlorine. The HI93414 is a multiparameter instrument that measures the most important parameters in drinking water: turbidity and chlorine. The instrument is based on a state-of-the-art optical system which provides accurate results by minimizing stray light and color interferences. Periodic calibration with the supplied standards compensates for any variations in intensity of the tungsten lamp. The colorimeter portion of the meter uses a 525 nm narrow band interference filter for maintaining the proper wavelength in the measurement of free and total chlorine. All measurements are performed with 25 mm round cuvettes composed of special optical glass to ensure maximum repeatability of turbidity and chlorine measurements. The HI93414 features three options for measurement including ratio mode for turbidity, free chlorine, and total chlorine. Turbidity measurements can be made in the 0.00 to 1000 NTU (Nephelometric Turbidity Units) range, while free or total chlorine measurements can be made in the 0.00 to 5.00 mg/L (ppm) range. The HI93414 meets and exceeds the requirements of EPA and Standard Methods both for turbidity and colorimetric chlorine measurements. When the meter is in EPA mode all turbidity readings are rounded accordingly to meet reporting requirements. A two, three, or four-point turbidity calibration can be performed by using the supplied (<0.10, 15.0, 100, and 750 NTU) standards. Calibration points can be modified if user-prepared standards are used. For free and total chlorine, the 1.00 mg/L (ppm) CAL Check standard can be used for calibration and performance verification. The AMCO AEPA-1 supplied standards are recognized as a primary standard by the USEPA. These non-toxic standards are made of styrene divinylbenzene polymer spheres that are uniform in size and density. The standards are reusable and stable with a long shelf life. With the powerful CAL Check function, reliable performance of the chlorine colorimeter can be validated at any moment by using the exclusive HANNA ready-made, NIST traceable standards. All standards are supplied with a Certificate of Analysis (COA) for traceability. For advanced field applications, the HI93414 is equipped with Fast Tracker - Tag Identification System (T.I.S.) that makes data collecting and management simpler than ever. Fast Tracker allows users to record the time and location of a specific measurement or series of measurements using iButton® tags near sampling points for quick and easy readings. Each iButton® tag contains a computer chip with a unique identification code encased in stainless steel. The HI93414 features complete GLP (Good Laboratory Practice) functions that allow traceability of the calibration conditions. Data includes calibration points, date, and time. Up to 200 measurements can be stored in the internal memory and recalled at any time. For further storage or analysis options, logged data can be downloaded to a Windows compatible PC using the RS232 or USB ports and the HI92000 software. A backlit LCD display provides an easy to understand, user-friendly interface. Displayed codes guide the user step-by-step through routine operation and calibration. Turbidity is one of the most important parameters used to determine the quality of drinking water. Once considered as a mostly aesthetic characteristic of drinking water, significant evidence exists that controlling turbidity is a competent safeguard against pathogens. In natural water, turbidity measurements are taken to gauge general water quality and its compatibility in applications involving aquatic organisms. The monitoring and treatment or wastewater was once solely based on the control of turbidity. Currently, the measurement of turbidity at the end of the wastewater treatment process is necessary to verify that the values are within regulatory standards. Turbidity of water is an optical property that causes light to be scattered and absorbed, rather than transmitted. The scattering of light that passes through a liquid is primarily caused by the suspended solids present. The higher the turbidity, the greater the amount of scattered light. Even a very pure liquid will scatter light to a certain degree, as no solution will have zero turbidity. Light source: Tungsten lamp operated at a color temperature between 2200-3000°K. Distance traversed by incident light and scattered light within the sample tube: Total not to exceed 10 cm. The sensitivity of the instrument should permit detection of a turbidity difference of 0.02 NTU or less in waters having turbidities less than 1 unit. The HI93414 meets and exceeds the meter criteria specied by the EPA Method 180.1 and Standard Methods for the Examination of Water and Wastewater 2130 B. The light beam that passes through the sample is scattered in all directions. The intensity and pattern of the scattered light is affected by many variables, such as wavelength of the incident light, particle size and shape, refractive index, and color. The optical system of the HI93414 includes a tungsten filament lamp, a scattered light detector (90°) and a transmitted light detector (180°). In the ratio turbidimeter range, the microprocessor of the instrument calculates the NTU value from the signals that reach the two detectors by using an effective algorithm that corrects and compensates for interferences of color. The optical system and measuring technique also compensate for fluctuations in lamp intensity, minimizing the need for frequent calibration. In the non-ratio turbidimeter range, the NTU value is calculated from the signal on the scattered light detector (90°). This method offers a high linearity on the low range but is more sensitive to lamp intensity fluctuations. The lower detection limit of a turbidimeter is determined by stray light that is detected by the sensors but not caused by light scattering from suspended particles. The optical system of the HI93414 is designed to have very low stray light, providing highly accurate results for low turbidity samples. The HI98703-11 AMCO AEPA-1 standards ensure that measurements are traceable to a primary reference materials. These standards are used for calibration and performance verification of the HI93414 turbidity meter. The HI93414-11 free and total chlorine CAL Check standards are used for calibration and performance verification of the HI93414. 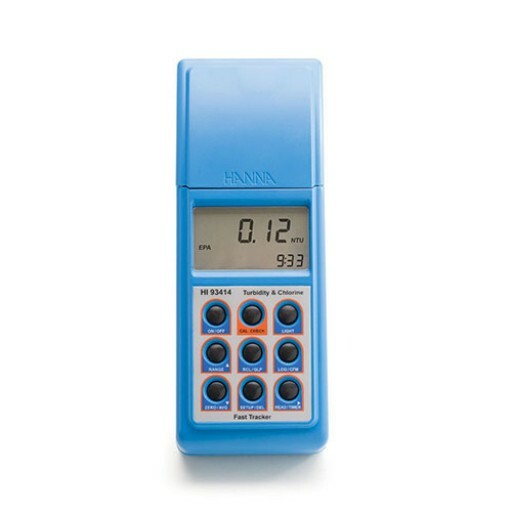 HI93414 is supplied with sample cuvettes and caps (5), calibration cuvettes for turbidity and chlorine, silicone oil, cuvette wiping cloth, scissors, batteries, AC adapter, instruction manual, and rugged carrying case.